Their Story was articled in "Out There" magazine, and was chosen as the 3rd "Captain Morgan" adventure of the year. Dave Briggs threw some dry grass into the air to check the wind direction at our launch pad, a beach on Lake Malawi's northern shore. It had taken a while to start the engines of our power paragliders, a process similar to getting a lawnmower into action. I revved the 210cc machine fitted onto me like a backpack, warming it up again, leaning forward, so that the blast from my propeller was directed skywards and not into the canopy laid out behind me, which could easily inflate and pull me backwards. I was ready.Briggs gave the proverbial thumbs up. I ran forward pulling my royal blue canopy from the ground behind me up into the air above my head. I looked up. Yes, it was fully deployed. "Go, go, go," shouted Briggs. I gave full throttle and felt the thrust of the motor strapped to my back pushing me as I ran. In a few metres I felt myself being gradually lifted up into the air as my feet left tera firma. I was airborne over Malawi! Still throttling hard, I climbed gaining altitude. The air was smooth in contrast to Tanzania, where we had intended to start our journey from the slopes of Kilimanjaro to Cape Town. 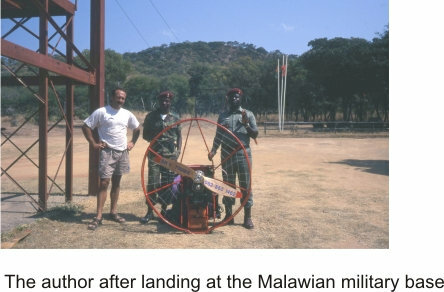 But lousy winds and lousier bureaucracy got the better of us, so pioneering powered paragliding of Lake Malawi, then Victoria Falls, became our new agenda. being tossed about in a strong, gusty thermal. Derek Crous, a yachtie in his retirement, was at the helm of the little Uno car, our back-up vehicle. Back in 1996, we had shared a cabin in the Cape to Rio yacht race. Briggs who manufactures powered paraglider motors, and I were paddling mates. We had all met in the army many years ago. I'm on the left and Briggs is on the right. We're standing on the Elephant Hills' helipad after a successful over Vic Falls. 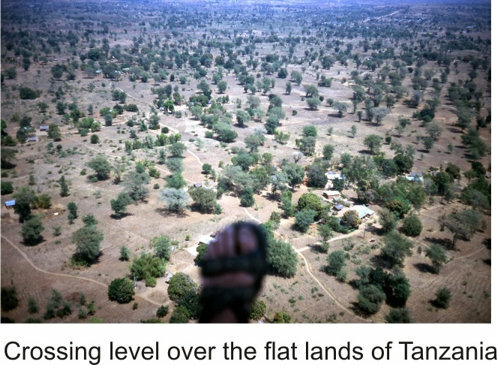 Back in the air above Malawi, I pulled down on my left toggle and turned gently in a large, lazy circle back towards the launch pad to see how Briggs was progressing among the many locals, mostly kids, who would always congregate around us, fascinated by our "flying sheets". From the air they looked like a seething mass of ants pointing up at me while running towards Briggs who was still pulling on his motor. I laughed, knowing that with each unsuccessful pull, he was becoming increasingly frustrated. Squeezing my throttle I decided to gain more height and follow the shores of the Lake for a while. Lake Malawi is the third largest lake in Africa, spanning 600km from north to south. The view was breathtaking: blue shades of vast lake contrasted with the white palm tree-lined beaches dotted with grass fishing huts. Women washing clothes on the shore looked up startled as we flew above them, not too sure what I was. Some ran for cover tohideaway from any danger I might have represented. Some stood still, gaping. Others smiled and waved more vigorous. I began to feel like royalty, waving serenely at everyone below me from my elevated position way above the beach. Fishermen, scattered over a few kilometres in their dugouts, tended to their catches as offshore fishing nets lay hooked to their buoys, suspended in the water. Briggs and I learned to keep an eye on the weather that in no time could conjure up thermals that would swat us out of the sky like flies. We kept having to get through them as they lifted us with speed, threatening to toss us off balance. Uncharted cross-country flying is literally about flying by the seat of your pants. You have 50 minutes of fuel and have to keep your eyes skinned for landing places, whether it's because your fuel is up or because you experience engine failure. Once we headed inland over a brilliant green wetland where a mass of white birds gave flight as the shadow of my canopy flew over them. 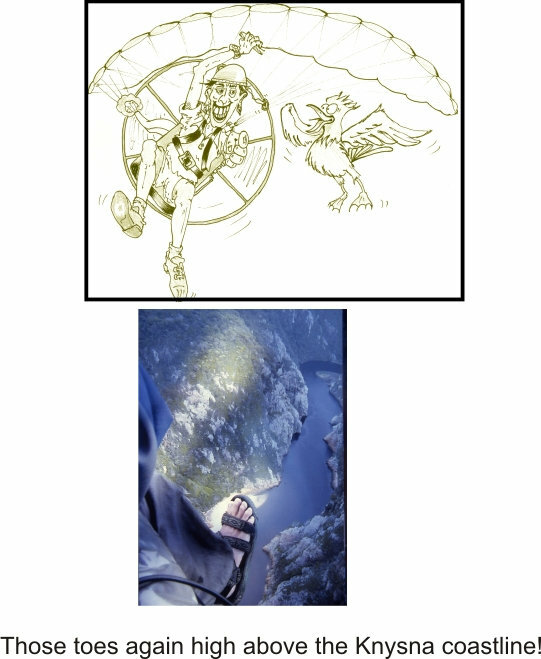 Suddenly the air became turbulent and I was thrown about in all directions. While midday sun meant warm weather for people on the ground, it created thermal after thermal that came pumping through like a steam train. The wind picked up. I would drop six metres, then immediately shoot up suddenly gaining altitude in the next thermal. Behind me Briggs was a kilometre away, but 400m higher. It was 40 minutes after take-off and I had lost sight of the Uno below. I urgently needed to start looking for somewhere to land. I scoured the ground below. Tall trees blocked any chance of landing on a clearing even the road. Then it happened. All at once my engine cut out as I was being tossed about in yet another strong, gusty thermal. "Why now?" I asked myself. Then I spotted a large, empty schoolyard. Without the motor I was losing height and wasn't able to circle my landing area to look for the best approach. Gliding for well over 500m, my best bet was to fly over some tall gum trees, low over the classrooms and onto the dirt yard. the air turbulence was all over the place with the wind direction changing. I was now in a bit of a rotor. It was going to be tight. I passed the gum trees over the corrugated iron roofs, then, a metre or so above the schoolyard, I pulled down hard on both toggles - stalling the canopy. As I touched ground, I ran a few paces forward, helped by the momentum of my canopy and weight of the motor. I had landed safely but didn't think about what would obviously happen next. Kids swamped me from all directions and a teacher came forward to say, "Good day, Sir. My name is Amos. Can you please tell me about this flying parachute so that I can explain (it) to my class?" Amos recorded with great accuracy everything he asked and wrote down my replies in an exercise book. He told me that he had been in the middle of a maths lesson when his kids in the class shouted, "Look! A white man has fallen from the sky!" The headmaster and other teachers joined us. I apologised for causing a disturbance at their school. "No, it's good, it's good. It's good for education. No-one has ever seen this before." The headmaster replied. Then the kids shrieked as they saw Briggs also gliding towards the school. By this time villagers, young and old, had joined the children and occupied almost every square metre of the bare patch. The teachers and I had to shoo the schoolyard clear, Crosswinds made Briggs' landing more tricky than mine. "Bloody hell, I ran out of fuel," he remarked as he saw me pushing my way towards him through the crowd. "So did I," I replied. Not only did we have the same mishap, but we both wrongly thought we had accidentally knocked our very sensitive kill switches which are designed to stop the engine immediately. It can happen easily in a thermal. ..below my dangling feet, was the "smoking thunder." .sitting in my harness suspended beneath my paraglider, a sense of absolute aeronautical freedom flooded through me. Looking down, below my dangling feet, was the "smoking thunder." In total awe I circled above the Falls, lining my camera up with one hand and before I knew it I'd used up a spool of film. This was one place I didn't want to run out of fuel and glancing at my watch I estimated I had just on 10 minutes left. Turning back to the helipad, I had a tail wind and in what seemed like a few minutes I had killed my motor as I came in to execute a perfect landing ending off what will always be one of my most treasured moments. 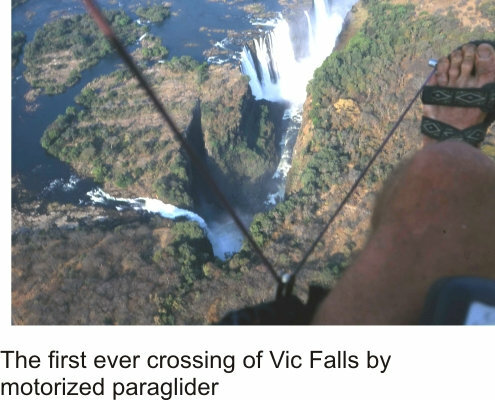 One of the many middle-aged American tourists, dressed in an Out of Africa outfit who gathered around us said in a deep southern drawl, "Hell man, it was something seeing you fellas be the first to fly a powered paraglider over Vic Falls. I guess you could say that more men have been to the moon than have flown over them there Falls hanging below that there parachute of yours!" Briggs and I gazed back towards the Falls with a glint in our eyes and replied, "Ja, and it was lekker man, really lekker!"